Froggy Lair is famous for macro and critter photography. This is the best site for muck and macro diving enthusiasts, it’s a nice drift dive just off the edge of the islands jetty with depths from 5 to 10m, and it is simply teeming with marine critters hidden along the seabed and in the holes. Sometimes, the limited visibility means you have to search carefully, but you will be rewarded by the sight of fascinating and colourful looking nudibranchs, ghost pipe-fish, mandarin-fish and scorpion-fish, as well as camouflaged frog and crocodile fish, and lots of fancy cuttlefish. 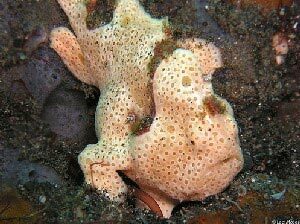 This dive site features unusual species often found here among the suspended particules. There are numerous nudibranchs of every shapes and colors, the occasional ornate ghost pipefish, several frogfishes of various colors and if you are lucky the flamboyant cuttlefish. You will need a divemaster with excellent eyes as the main action will not be in the distance but closer to your mask. Location: North East of Sipadan Island.